One of Washington’s greatest policy failures is North Korea. Pyongyang’s most recent provocation apparently was hacking Sony Pictures in retaliation for the movie The Interview. More fundamentally, despite manifold U.S. efforts to enforce nonproliferation the Democratic People’s Republic of Korea remains determined to create a sizeable nuclear arsenal. Successive administrations have sought China’s aid to restrain the DPRK, but have failed to listen to Beijing while lobbying Chinese officials for their support. If Washington hopes to win backing from the People’s Republic of China, American policymakers must respond to the PRC’s recommendations and concerns. Understandably distrustful of Pyongyang, the U.S. has insisted upon denuclearization before delivering substantial benefits to the North. However, when approached by Washington for assistance, China has responded by blaming America for creating a sense of insecurity which encouraged the DPRK to develop nuclear weapons. In Beijing’s view the DPRK will not yield its nukes so long as it feels insecure. Of course, Pyongyang might not do so in any case. But it almost certainly is true that the Kim regime will not give up what looks like the ultimate security guarantee if it believes its future is at risk. And the North has no reason to take U.S. promises on faith. Just as Washington has good reason to disbelieve North Korea’s commitments, so the DPRK has fair cause to distrust America. Just ask Moammar Kaddafi, who made a deal sacrificing his nukes and missiles in return for engagement, only to be ousted by the Western powers at their first opportunity. Moreover, Pyongyang currently has nothing positive to lose from disruptive behavior. The administration recently tightened sanctions again. But in practice not much is going to change, especially since the PRC continues to moderate punitive U.S. actions. So long as Beijing allows trade, provides aid, and ignores sanctions, international “sticks” are of little effect. Washington and its allies should consider an alternative approach. Together develop a comprehensive proposal for a grand bargain. In exchange for the DPRK’s denuclearization and withdrawal of advanced conventional forces from near the DMZ, the allies would provide diplomatic recognition, end economic penalties, and eschew attempts at regime change. The U.S., South Korea, and Japan then should present the package to Beijing for its suggestions and, more importantly, support. The allies would have demonstrated that they had listened to China and were prepared to change the security environment facing the North. Pyongyang would lose its excuse for not responding positively. In return for taking the PRC’s advice, the three allies could request that Beijing back allied efforts, including with the threat of cutbacks in aid, trade, and investment. After all, rejecting such a deal would demonstrate that North Korea, not the U.S. and its partners, was ultimately responsible for the threat of nuclear proliferation which China opposes no less than its neighbors. Only such a strategy of U.S. engagement seems likely to galvanize Beijing to action. The PRC worries about regional instability and fears a united Korea allied with America and U.S. troops along the Yalu. Especially as long as Washington appears to be engaged in a campaign of containment China has no reason to do the U.S. any favors. Even more so if the Chinese believe, as some have suggested, that Washington is using the North’s program as an excuse to expand U.S. military involvement to use against the PRC. Indeed, Washington should consider such an approach to China as part of a broader process of relearning the art of diplomacy. America’s military-first policy is not working out very well anywhere, and especially against the PRC. U.S. frustrations with North Korea are obvious and understandable. Nothing seems to work, and the administration’s latest sanctions are unlikely to have a different result. At this stage Washington has little to lose from taking China’s advice on how to address Pyongyang. 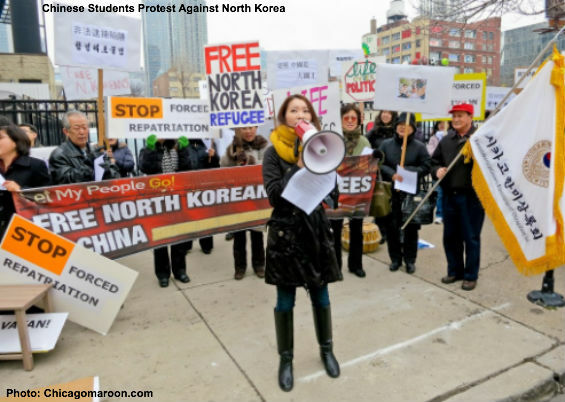 It is time for both the U.S. and PRC to act. Submitted by David Givens on Thu, 01/22/2015 - 22:18. SET YOUR HAIR ON FIRE! NORTH KOREA HAS NUKES! What can we do? What can we do? We can do what a lady who is afraid of snakes would do if she saw a rattle snake in her neighbor’s back yard. She would be afraid it would crawl into her yard and bite her so she would ask her neighbor to kill it. There is a rattle snake in China’s back yard. Ask China to kill it.